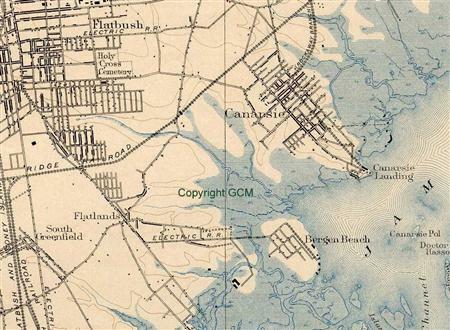 In the early 1900's, Canarsie Landing became a very active summer place. There were eighteen or more hotels, a dance hall, an oriental bar, a casino and other establishments. In May of 1907, Golden City Park opened its doors near Seaview Avenue to rival Coney Island. It closed in the late 1930's. Before becoming a BRT elevated line in 1906, the Canarsie Line operated as a steam dummy line. It was first owned by the Brooklyn and Rockaway Beach Railroad, chartered December 24, 1863 and opened October 21, 1865, from the Long Island Rail Road in East New York to a pier at Canarsie Landing, very close to the current junction of Rockaway Parkway and the Belt Parkway, where ferries continued on to Rockaway. The line was single-tracked until 1894. The Canarsie Railroad was chartered on May 8, 1906 as a BRT subsidiary (leased to the Brooklyn Union Elevated Railroad) and acquired the line on May 31, 1906. The line was partly elevated, and electrified with third rail on the elevated part and trolley wire on the rest, south of New Lots Avenue. The Long Island Rail Road, which had used the line north of New Lots to access their Bay Ridge Branch, built a new line just to the west. The East New York terminus was extended several blocks along a section of line formerly used for "East New York Loop" service to the Fulton Street Elevated and the Broadway Elevated (now the BMT Jamaica Line), at a point known as Manhattan Junction (now Broadway Junction). Service, first run on July 28, 1906, ran from Canarsie Landing to the Broadway Ferry at the foot of Broadway in Williamsburg, at the East River. This route still exists as the BMT Jamaica Line, except for the last piece to the East River, where the Jamaica Line runs over the Williamsburg Bridge. The route was later extended over the bridge and along the BMT Nassau Street Line to Canal Street and then Chambers Street.